Unless you are completely unfamiliar with geek culture conventions, you’ve heard of Dragon Con. If you haven’t, Dragon Con is a convention held in Atlanta, Georgia. It’s been going on since 1987 and every Labor Day weekend, over 50,000 total strangers come to Atlanta to become best friends for the weekend by sharing their various love affairs with geek culture. We at the Geek Forge call it “Nerdy Gras”. As you can see from those numbers, Dragon Con doesn’t need me to sell you on the convention, so I’m not going to bother to try. What I’m going to do is tell you why Dragon Con wants you and why you are likely to want Dragon Con. My history with Dragon Con starts in 1990. I had been a regular attendee of conventions in Atlanta since 1978, but in 1990, Dragon Con hosted the Origins Game Fair and that was something I couldn’t miss. The moment I walked into the Con, I noticed that it was different than other conventions that I had attended. The guests mingled with the fans on an intimate level. The line between fan and guest was blurred to such a degree that it felt like we were all celebrating this event together. Turns out that we were. I could tell you a lot of very personal stories about this shared experience, but I’ll focus on one event that occurred at Dragon Con 1994. In 1994, Image Comics was huge. They were the hot Young Turks of the comic industry and everyone was imitating them. Comics were full of mullets, pouches, gritty heroes, and everyone was wearing leather jackets. As I walked through the exhibitor’s hall, I pushed my way through the crowd in front of the Image Comics booth to the DC Comics booth and I did a double take. Sandwiched between the two was a small table for MAD Magazine. Sitting at the table was Don “Duck” Edwing. Duck was a gag cartoonist who wrote and drew for MAD for 5 decades. He created this little strip called “Spy vs. Spy.” As creators go, he is kind of a big deal. I stopped to talk for a moment and told Duck how much his work meant to me and I ended up spending half the convention with him and his wife. That conversation stuck with me over the years and since then I have heard the same words from Jeanette Khan, Martin Nodell, Julius Schwartz, Mike Grell, Stan Lee, and a dozen others. Nowhere is this truer than Dragon Con. It’s been 24 years since my first Dragon Con and the landscape has changed to make that story even more truthful. 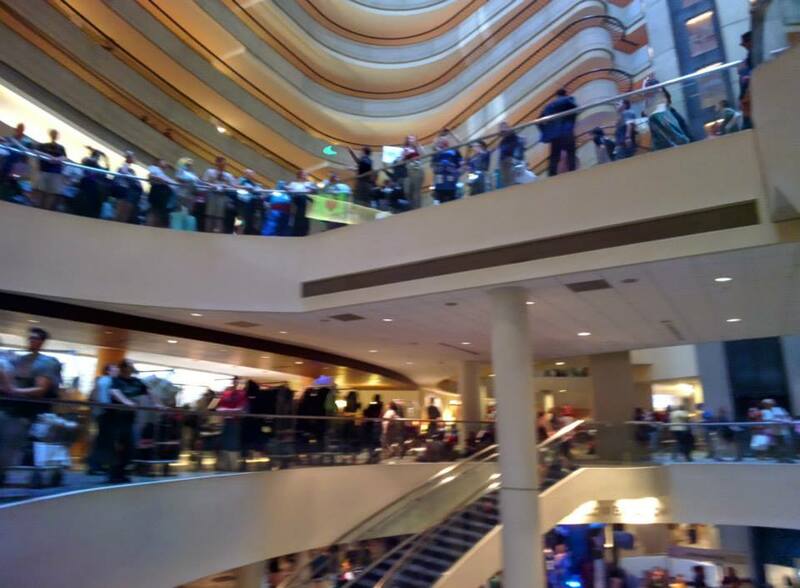 Dragon Con is a convention where the fans are the stars and the guests are just as likely to take a selfie with a cosplayer or sit down and chat at dinner as fans are to stand in line for an autograph. Dragon Con is messy, loud, and frantic. It’s often crowded and chaotic. It’s like a family reunion. It’s like a block party. It’s Nerdy Gras and that’s what makes it different; that’s what makes it great. It’s not a convention anymore — it’s a celebration and that itself is worth celebrating. I was there in 1990, too. In fact, this was the first con you and I went to as a part of the same group. I had been to D*C the previous year, and really enjoyed it. Any convention is, or can be, a lot of fun. Dragoncon was no exception. Over the years, of course, I wasn’t able to go as often as I would’ve liked, but that is life. If you’ve never been to DC, go. You will have a blast.